PressTV: Russia has voiced regret over the extension of the US sanctions against Moscow, saying it will consider possible counter measures. Kremlin spokesman Dmitry Peskov says the sanctions are a continuation of Washington’s “unfriendly stance against Russia”, which have a devastating impact on bilateral relations. Russian deputy foreign minister Sergey Ryabkov has also condemned the move and accused US government institutions of what he called acting zombie style. He added that the new sanctions may change the reality of relations between Moscow and Washington. Earlier, the US treasury announced an updated sanctions list targeting 34 individuals and entities in Russia to put pressure on Moscow over the crisis in Ukraine. Peter Koenig: As I said on other occasions – Washington simply cannot let go. These sanctions have nothing to do with reality. These sanctions are used for propaganda purposes. Russia – especially Mr. Putin – must remain the villain in the eyes of the western world which is mercilessly subjected to media lies and falsehood time and again. Washington has no interest in peace, or peaceful relations with Russia. These sanctions just show the farce and hypocrisy behind John Kerry’s recent visit to Moscow, when he acted like a well-behaved little boy wanting to please and cooperate in the fight against ISIS. What a miserable farce. The Islamic State or Daesh or ISIL – for those who still believe the Islamic State emerged out of the blue – the ISIL/S monster is the creation of the composite of other monsters, the Pentagon (already at the early stages of the Iraq war), NATO and CIA, entirely supported and funded by the US, Saudi Arabia, Qatar, NATO – and yes, Turkey – trained by the CIA, associated secret services and NATO. Obviously everything Kerry and Obama say in terms of cooperation is an outright lie. It is propaganda making the western world believe that if cooperation doesn’t happen it is Russia’s fault. As the extension of these sanctions just show again. Back to sanctions. The main argument for them is Ukraine – and of course, always, so the western stooges won’t forget, as a by-line – the invasion and ‘annexation’ by Russia of Crimea. Western media never mention that the people of Crimea themselves launched a referendum to re-join their motherland to where they belonged for hundreds of years. By now everybody should know that the coup d’état in Kiev that killed a hundred people at Kiev-Maidan on 21 February 2014, when the democratically elected president was deposed, was instigated and funded by the US and NATO, directed from Washington’s Embassy in Kiev and carried out by Washington paid mercenaries. PressTV: On 21 December Brussels also decided to extend their sanctions on Moscow. Why is that? What does the EU get out of these sanctions? PK: Europe plays Washington’s ball game. They have to. The EU puppets have conceded long ago the last vestiges of their sovereignty to Washington. They have no own will. The self-styled lords of Brussels, those who make-believe they command Europe, those of the unelected European Commission, have nothing to say, nothing to decide – just to follow Washington’s orders. Unfortunately this is a fact. A living proof is the ongoing behind closed doors ‘negotiation’ about the evil TTIP (Transatlantic Trade and Investment Partnership) – to which not even EU deputies have access. If ratified, it would be so nefarious for Europe (as would be the TPP for 11 Asian and South American partner countries), those in Washington with their puppets in Europe who pull the strings are afraid, that if it would be made public – it would not only fall apart, but might cause an anti-globalization revolution in Europe. As long as spineless lackeys are sitting in Brussels and are tolerated by a duped European public, there is no alternative – Brussels will follow the dictate of Washington for everything, and of course also for sanctions. 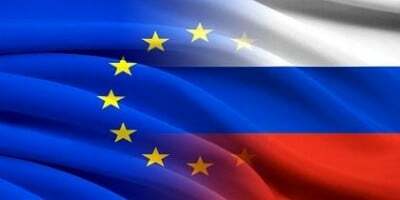 This regardless of whether these so-called sanctions hurt Europe far more than Russia. That is immaterial. This is part of Washington’s ‘Plan’. For those who don’t know – the EU was from the start a product of the United States, beginning with the 1948 Brussels Treaty, coerced as a European concession for the Marshall Plan and signed just after WWII. That ‘treaty’ or contract was covertly (for the public) followed and directed through a string of other treaties, all the way to the Maastricht Treaty, the basis for the current EU, and on to the present-day Lisbon Treaty. The EU doesn’t have a Constitution uniting them as a political entity. Why? – Because Washington didn’t have a free and sovereign Europe in mind when they initiated in 1948 the process that eventually led to the so-called European Union – which, in reality has little if anything to do with a union. Such a non-union is not sustainable. No solidarity between nations and everyone for him-self is exactly what Washington wanted – the old divide to conquer. And they got it. It’s blatantly glaring into every citizen’s face, but they are blinded and can’t see it. Probably many European politicians don’t even know that the Mastermind behind this built-to-fail malicious construct, the EU is the US of A – not Europe. And the common currency the Euro, in a Union that has no political goal and objective cannot be sustainable and is bound to fail. This is demonstrated by the presently ongoing semi-clandestine purchasing of government bonds by some of the EU member countries’ central banks, an act which is per se against the official ECB (European Central Bank) rules. It is, however, quietly tolerated by ECB’s President Draghi, a former Goldman Sachs Executive, for some privileged countries, like France, Italy and perhaps some others. This local money-printing serves to balance over-burdened state budgets, at the same time putting more liquidity into banks, making them more vulnerable. Draghi is shaping European monetary and financial policies exactly the way the Wall Street- FED tandem wants it. Never mind that these ECB ‘rules’, enforced by blackmail and criminal intimidations for some countries, like Greece, are against member countries’ sovereignty; sovereignty which they have not given up in any signed document or treaty. Had Greece sidestepped this ‘rule’, as others are doing, resisted the threats and produced her own euros to revamp their economy, as an internal debt, rather than a huge and high-interest debt to German and French private banks, their economy would now be recovering rather than sinking into a bottomless pit. Europe had now the opportunity to say STOP. No more sanctions. No more following the Washington dictate; no more committing economic suicide – and punishing the only true, honest and long-term real partner, Russia. The Merkels and Hollands and consortia, those supposedly in charge of Europe, they know very well who is behind and instigated the Ukraine bloodbath, the civil war which left millions homeless, causing a flood of more than 2 million refugees into Russia. They could have said NO to more sanctions and break loose and free from the fangs of the US. But they didn’t. They can’t. Sadly Brussels and the entire gang of politicians that command over 28 member countries BELONG to Washington. Yes, correct: they are enslaved to Washington. You may only speculate what miht happen to them, if they would dare exiting the miserable path of destruction they have embarked on. This mob of spineless vassals is afraid of – or sold to – the naked emperor and his cardboard sword. PressTV: What will be Russia’s reaction and how will it impact. PK: The Impact of the sanctions on Russia will be minor, compared to the impact these sanctions have already had and will continue to have on the European economy. Over the last year or so, Russia’s economy has begun adjusting to the ‘sanctions’ regime, by becoming self-sufficient, revamping her agriculture and industrial production, largely delinking the economy from the deceitful dollar, building a close economic (and military) alliance with China and the other BRICS and SCO countries (Shanghai Cooperation Organization). China and Russia have developed their own international payment system (CIPS – Chinese International Payment System) which replaces the western SWIFT system and circumvents the control of the obscure BIS (Bank for International Settlements), also considered the central bank of (western) central banks, a 1930 Rockefeller-Rothschild construct. In the last two years the BRICS and SCO countries have started dealing among each other outside the dollar control, in their own currencies which makes them less vulnerable to the illegal US-EU sanctions. Surely, the US / Saudi engineered drop of the oil price from about US$ 100 / barrel a year ago to US$ 40 to ‘hurt’ US enemies, particularly, Russia, Venezuela and Iran, is harming any hydrocarbon producer. It is even ruining America’s own fracking industry. Maybe Washington absurdly considers this a small sacrifice for conquering the world. Among themselves BRICS and SCO countries which, by the way, make up about 50% of the world population and about one third of the world’s GDP, are trading hydrocarbons in their own currencies and in some cases with the outside world in gold. As Russia is moving out of the dollar system, sanctions will have an ever declining impact. Russia and China can today easily survive and thrive without the dollar. This is not mainstream media news, as it doesn’t fit the anti-Putin propaganda purpose. Russia’s response to the sanctions will continue to be barring imports from the EU, agricultural produce, as well as manufactured goods, leaving hundreds of thousands if not millions of European workers without a job, or with jobs at risk. In Germany alone, estimates range from 300,000 to 500,000 employments being lost or at risk. This compounded with the endless influx of highly educated refugees from Syrian and Iraq, from the very countries the US and NATO devastated may leave the European labor market – and economies – in shambles. This is exactly what Washington wants. The elite of the European serfs of the self-proclaimed hegemon must know this. They know what’s at stake for Europe’s future. Yet somehow they are bound – like in an occult evil alliance – to Washington, condemning perhaps hundreds of millions of future generations to misery. It sounds and looks like a criminal conspiracy to help America to reach global hegemony; a conspiracy of those same Europeans whose forefathers have usurped, colonized and raped Africa, Asia and the Americas for hundreds of years. But they are not there yet – and most likely won’t achieve this elusive goal. Russia and China and their allies within the BRICS and SCO are strong countries, with a strong and free monetary system backed by their strong economies – unlike the criminal fiat dollar system that keeps unaligned and un-obedient countries hostage with sanctions. The BRICS (Brazil, Russia, India, China and South Africa) have already created two development institutions to challenge and replace the World Bank and the IMF, the Asian Infrastructure and Investment Bank (AIIB) and the New Development Bank BRICS (NDB BRICS, formerly the BRICS Development Bank), both located in Shanghai. Unlike at the World Bank and IMF, no country has a veto, and decisions are taken by one country one vote. These economies don’t need fraud, financial coercion and military aggression for survival as Washington does. Russia and China and the other BRICS and SCO countries’ presence with their free and fair trade and monetary system, delinked from the dollar, will eventually attract all those that have been suffering under US oppression for years and decades. With President Putin’s speech at the UN General Assembly on 28 September and Russia’s subsequent intervention in Syria to truly fight the western made terror – a worldwide awakening has started and the tectonic shift of the political plates has begun. Peter Koenig is an economist and geopolitical analyst. He is also a former World Bank staff and worked extensively around the world in the fields of environment and water resources. He writes regularly for Global Research, ICH, RT, Sputnik, PressTV, CounterPunch, TeleSur, The Vineyard of The Saker Blog, and other internet sites. He is the author of Implosion – An Economic Thriller about War, Environmental Destruction and Corporate Greed – fiction based on facts and on 30 years of World Bank experience around the globe. He is also a co-author of The World Order and Revolution! – Essays from the Resistance .